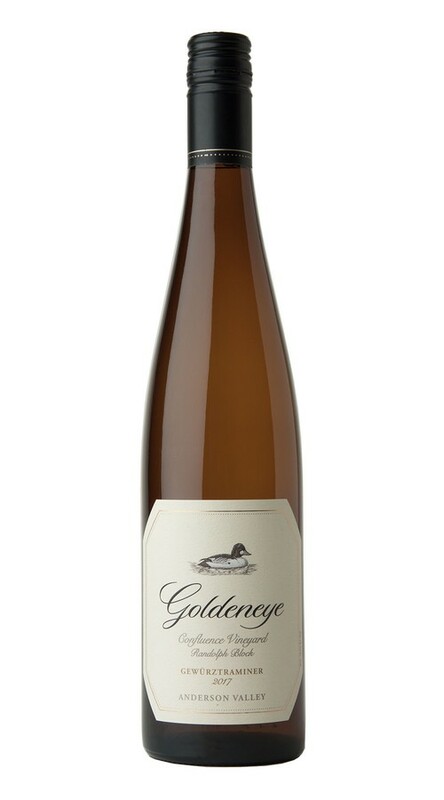 The Goldeneye Gewürztraminer is derived from a one-acre block of our Confluence Vineyard. The Gewürztraminer is night harvested and whole cluster pressed before first light to preserve the inherent freshness of the varietal. The juice is fermented in stainless steel for up to 45 days at 45 to 50 degrees which maintains the aromatic character so important to Gewürztraminer. The Gewürztraminer is bottled shortly after completing fermentation and is best served cold as a wonderful accompaniment to a variety of foods. This beautifully aromatic wine begins with enticing layers of ginger spice and rose petal. The high-tone spice elements are echoed on the palate, where they mingle with layers of lychee and honeysuckle. Throughout it all, a backbone of natural acidity adds poise and definition to the graceful flavors, while carrying the wine to a bright, focused finish. The 2017 season began with plentiful rains that resulted in healthy vines and an excellent crop. After ideal temperate weather throughout the summer, a significant September heat spell ushered in a brisk start to harvest. A return to normal temperatures, combined with thoughtful irrigation, slowed the pace and allowed us to continue picking each site at optimal levels of ripeness. The grapes arrived at our winery in exceptional condition, resulting in complex wines that embody the rustic elegance of great Anderson Valley winemaking.